Are you developing a plot of land? If the answer is yes then proving you are not harming or disturbing any protected animals is a legal planning requirement. To achieve this planning requirement you will normally need to submit an Extended Phase 1 Ecological Survey with your application as a minimum. 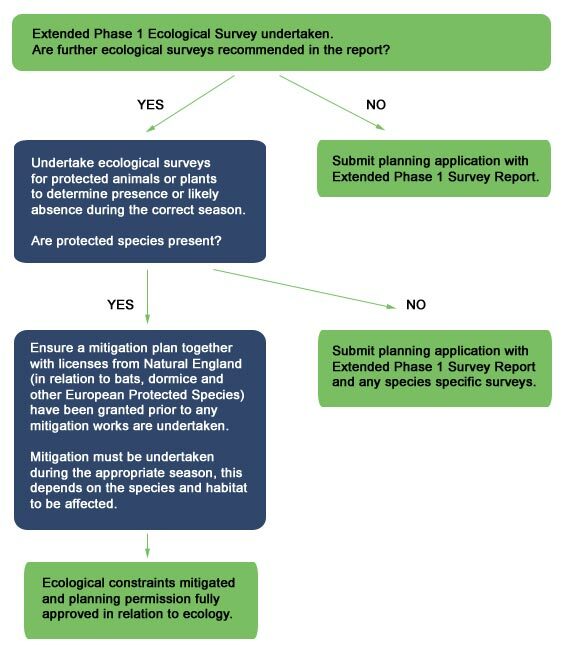 The flow chart below shows the normal procedure within the planning process in England with regards to ecology. To reduce, or in some cases remove the need for lengthy and costly mitigation/translocation plans, speak to us at the design stage of your project. We can help you to design out constraints and design in ecology. Our ecology surveys, ecological surveys and ecological surveyor (ecology surveyor) practice throughout London and the South UK including places like Hampshire, East Sussex, West Sussex, Surrey, Berkshire, Kent, Essex, Hertfordshire, Bucks, Ilse of Wight and Rottingdean, Hythe, Polegate, Crawley, Sittingbourne, Brighton, Margate, Eastbourne, Goldaming, Wokingham and more! 23/04/19.